I had to try one more time. I want a peach muffin without peach pieces, is that so wrong? They taste damned good, though. 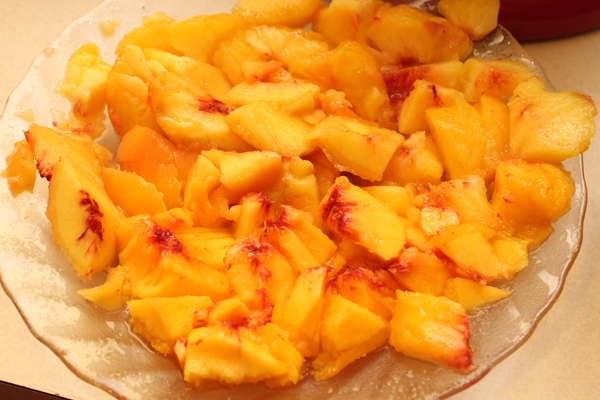 And I’ve got my peach pureeing process down to a science. 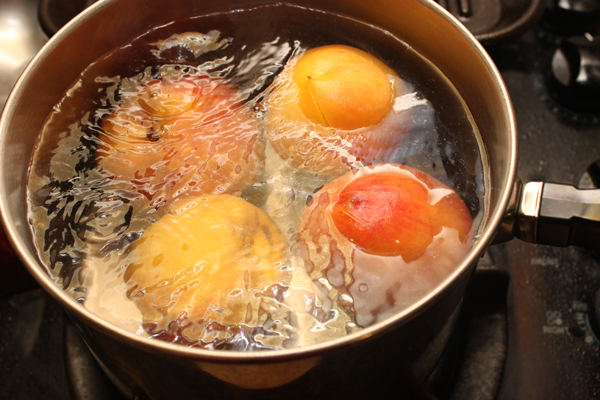 I scored each peach on the bottom, and put a pot of water on to boil. 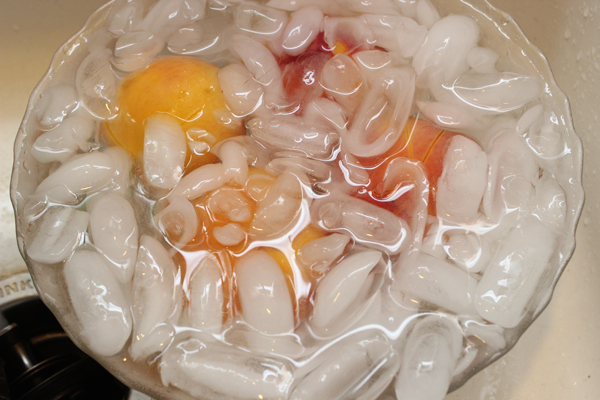 Once it was all bubbly and crazy, I popped the peaches in there for 60 seconds. Once my minute was up, I promptly plunged them into an ice bath. And after about another minute, I removed them and peeled the skin off, just like that. That done, I focused my attention the dry ingredients. 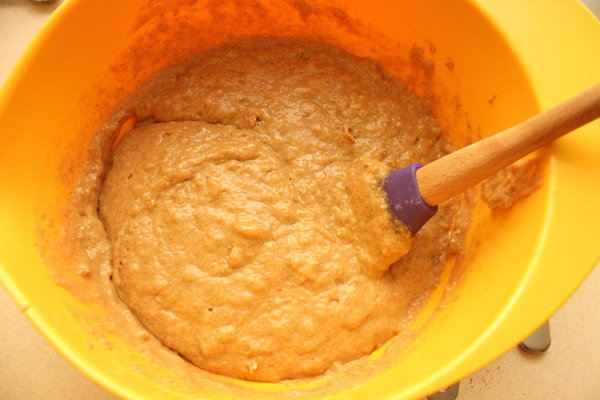 As always, I replaced all purpose flour with a combination of whole wheat white flour and wheat germ. 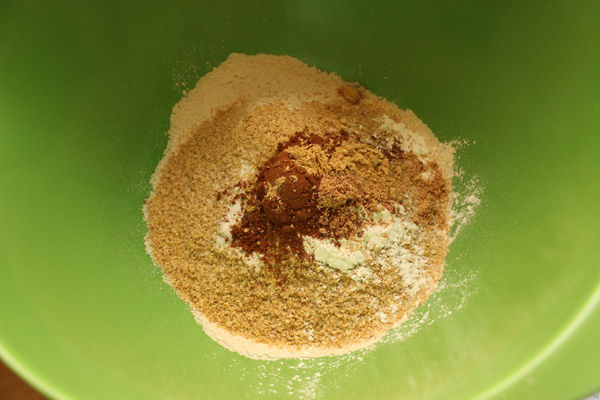 I added baking soda, baking powder, kosher salt, and then the spices, quadrupling the cinnamon, doubling the nutmeg, and increasing the ginger by half. 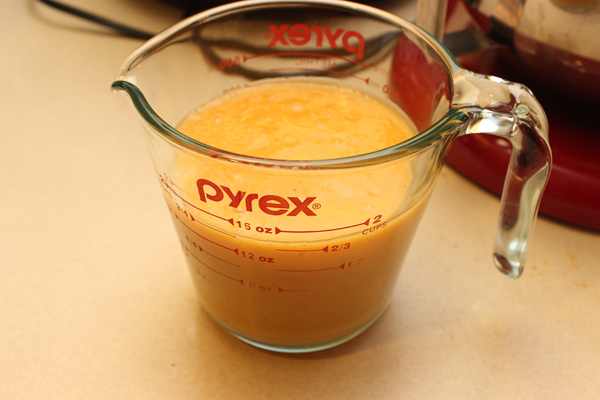 Then I combined the liquid ingredients: peach puree, eggs, brown sugar, vanilla bean paste, melted butter, and peach Greek yogurt. 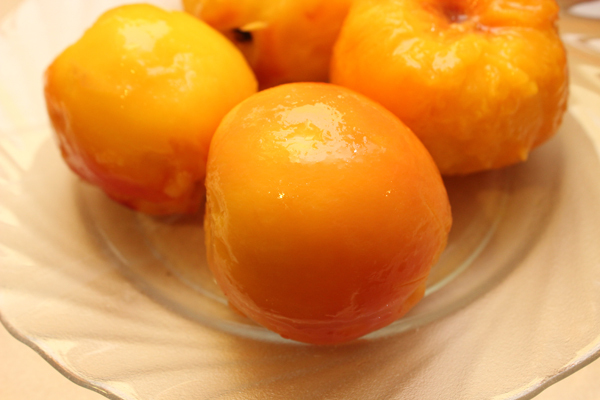 (I thought that would help increase the peach-y-ness.) It looked goopy. 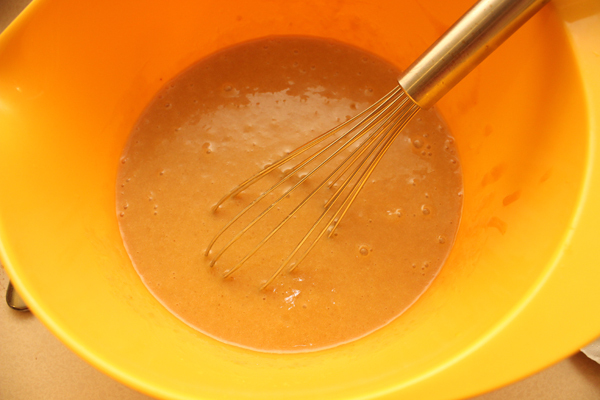 I whisked. 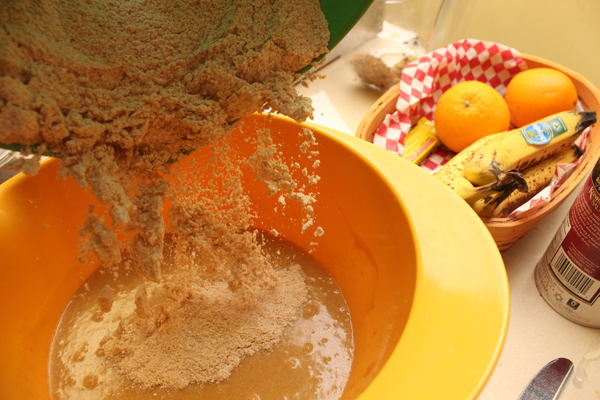 And then I poured the flour mixture into the peach one, which made me think that I should have used the big green bowl for the liquid ingredients and the smaller one for the dry. Oops. I mixed. Carefully. Thoughtfully. Lovingly. 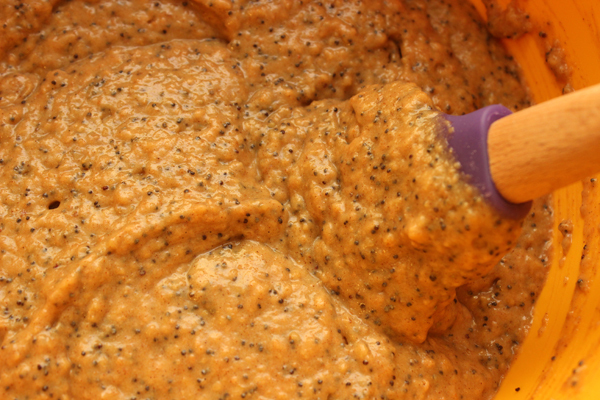 And then, just as carefully, thoughtfully, and lovingly, I added three tablespoons of poppy seeds. It just seemed like a good idea. They took 23 minutes in a 350-degree oven. 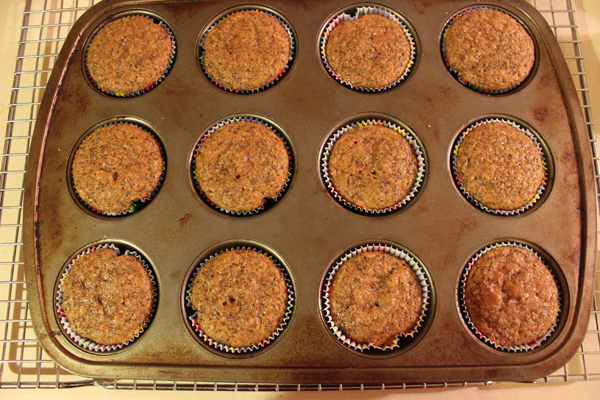 I let them sit in the pan for a few minutes before moving them to a cooling rack. And I tasted them as soon as they were ready. 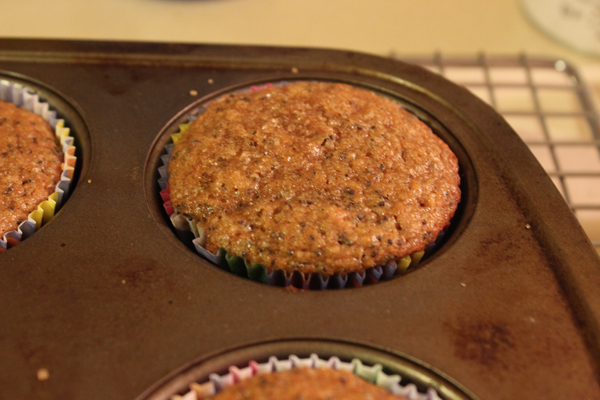 I’ll tell you something; they may not taste particularly peachy, but they are excellent muffins. Dave ate two of them that night alone, since the recipe makes about 20, and maybe, you know, I ate two as well. They’re too hard to resist, as well as unnecessary to resist, since they’re only 3 P+ and I could get that even lower by reducing the sugar next time. But they’re a real treat to eat, and taste like dessert, and get addictive quickly, so even without the strong peach flavor I’m hankering for, I still think these are a win. 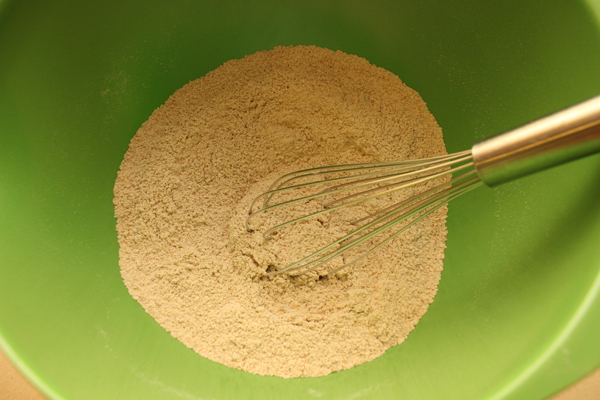 Whisk together the flour, wheat germ, baking powder, baking soda, salt, cinnamon, nutmeg, and ginger. Set aside. 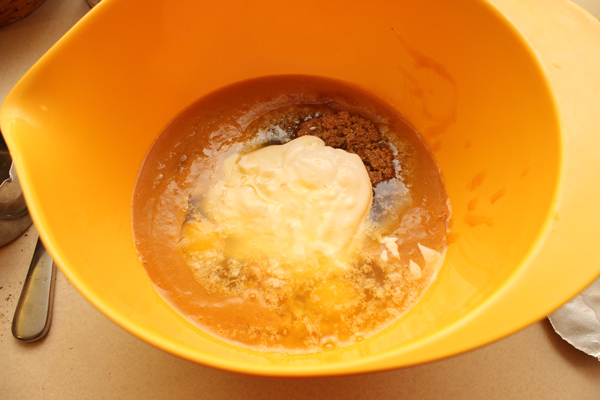 In another bowl, whisk together the peach puree, eggs, browns sugar, yogurt, vanilla, and melted butter. 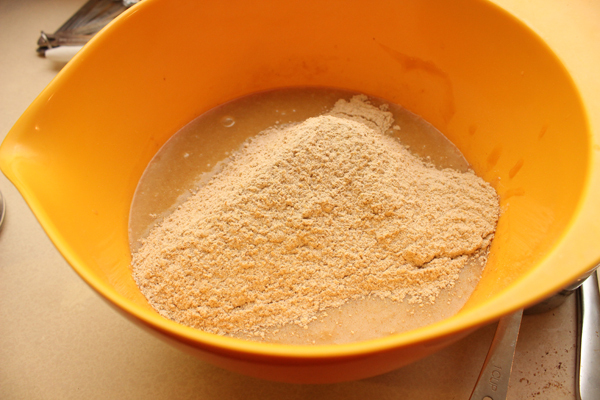 Pour the dry ingredients into the bowl with the peach mixture and gently stir to combine, stopping when the flour has disappeared. 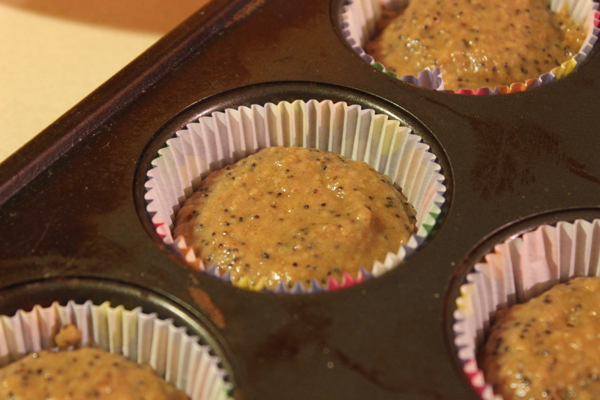 Fold in the poppy seeds. 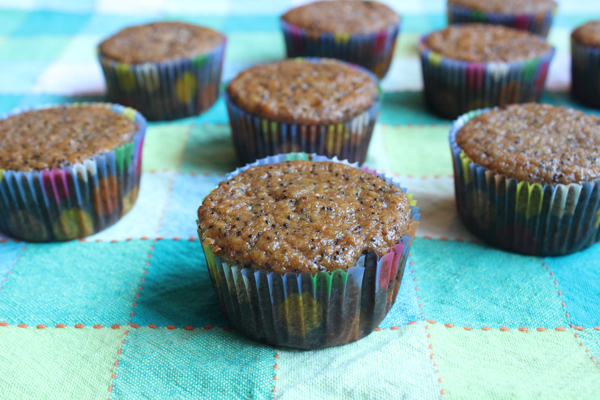 Scoop batter into muffin cups. 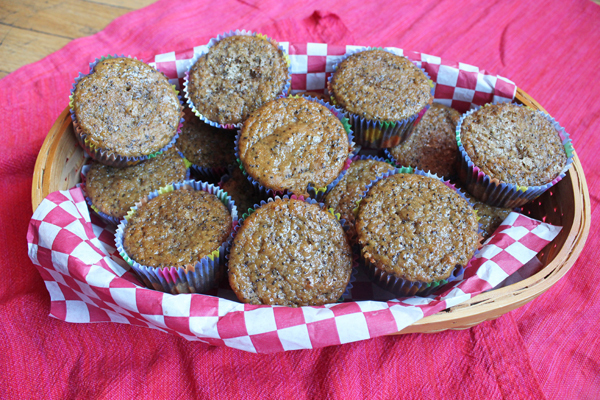 The amount of muffins you get will vary, depending on how much you fill the cups. 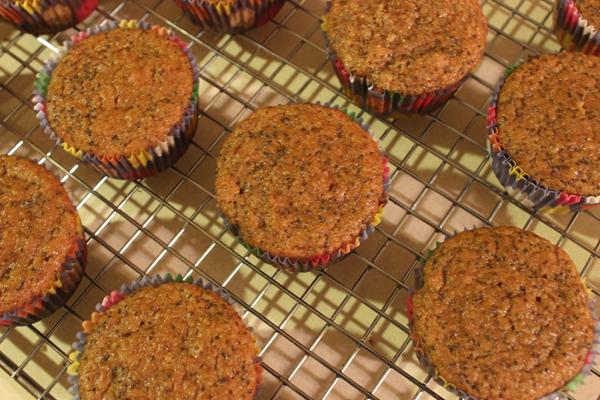 Sprinkle turbinado sugar on top of each one. Reduce oven temperature to 350 degrees and bake for 20-25 minutes. Let the sit in the pan for another 5-10 minutes, then move to a wire rack. 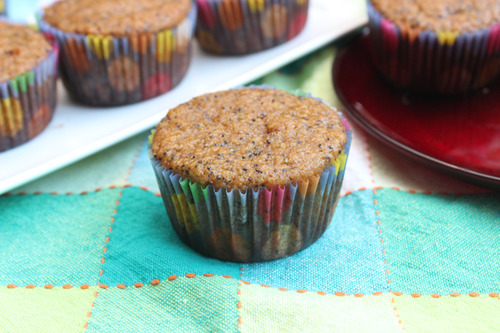 These muffins really come into their own both texture-wise and flavor-wise the next day, so resist eating them right away if you can.